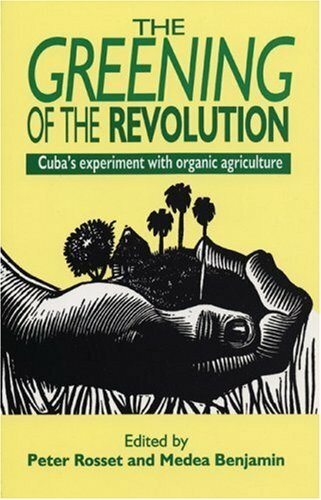 nice short (almost pamphlet-like) book put out by global exchange about the cuban organic agricultural revolution in the early 90s. in short, after the soviet union collapsed and oil imports dried up, the cuban government avoided disaster by going green, making all agriculture organic and community-driven, opening up small-scale private ownership and reversing the industrial trend of food-making. everyone interested in organic agriculture, the environment, cuba, or peak oil, absolutely should read this and related books. A concise, easy to read account of how the Cubans adopted organic, sustainable agriculture. Sure, the had to, but they still did. Interesting to see if they still are. Peter Michael Rosset - Dr. Peter Rosset is based in Oaxaca, Mexico, where he is a researcher at the Centro de Estudios para el Cambio en el Campo Mexicano (Center of Studies for Rural Change in Mexico), and co-coordinator of the Land Research Action Network. He is also Global Alternatives Associate of the Center for the Study of the Americas and an affiliated scholar of the University of California, both in Berkeley, California, USA. He is the former co-director of Food First/The Institute for Food and Development Policy in Oakland, California.He previously served as executive director of the Stanford University Regional Center in Chiapas, Mexico. During the 1980s he spent eight years in Central America, where he led several sustainable agriculture projects. Peter has taught at Stanford University, the University of California at Berkeley, the University of Texas at Austin, the National Agrarian University of Nicaragua, the Havana Agricultural University (ISCAH) and the University of Las Villas, both in Cuba, and the Tropical Center for Agricultural Research & Education (CATIE) in Costa Rica. Peter has also been a Fellow of the John D. and Catherine T. MacArthur Foundation, and is a Board Member of Focus on the Global South in Thailand.He is a food rights activist, agroecologist and rural development specialist with a Ph.D. from the University of Michigan.